Well, we’re now in South Korea after our 13 hour flight from Detroit. It’s nearly 4am at home, but it’s almost 6pm in the evening here. Libby and I agree that it does feel more like evening… so, this bodes well for adjusting to the time difference. The flight itself (in Economy Comfort, aka Oxymoron Class) was decent. I wish I’d slept a little better, but the timing wasn’t great for that (noon to midnight). I also had the strangest experience on the airplane. I finallyq fell asleep about 4 hours out of Incheon. Something woke me up 30 minutes later, and I found myself lightheaded and disoriented. I sort of staggered down the aisle to use the WC and then struggled to open the door. Within a few minutes of making it back to my seat, all was normal again, and I now feel fine. So, it seems like I was just suffering from total exhaustion, which sort of makes sense given my schedule of the last week or two. The Incheon/Seoul airport is very nice. Too bad we won’t get to see more of the country (on this trip, anyway). But, it still counts as country #73! P.S. 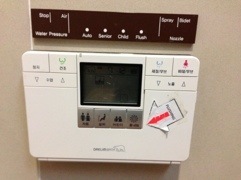 Here’s the “control panel” for the high tech toilets at the airport in South Korea. Basic operation is easy, but the advanced features seemed too dangerous to explore. Glad to hear that the disorientation went away quickly! Enjoy the trip! Well, you don’t even let your friends know you are traveling somewhere again. Will this trip involve a cruise or just flights. Hope you have a great time and as always, I am looking forward to your posts and photographs. I am jealous as usual. Just flights… no cruising for us this time. Just a short getaway.